When the awesome folks at Shop Rite, picked me to be on their blog panel and invited me to the NYC Food and Wine Festival. I was able to meet the other bloggers that were chosen as well to be on the panel. One of them was Keeley, if you haven’t checked out her blog yet, check it out at My Life On A Plate. But anyways, she was awesome and her husband was just as awesome as well! Both of them are super funny, such a cute couple! Of course after the festival, I had to go home and check out everyone else’s food blogs, wait, what I am talking about, I checked out everyone’s food blogs while we were in NYC, haha! But really, I took a more in-depth look at them after we returned home. I found this recipe on Keeley’s blog. I was excited to try it, because Chris isn’t a fan of Chinese take out and I love it! So if I want that type of cuisine, I have to cook it at home, for some reason the husband will eat it at home but not out! Plus I was able to get out my wok, which I absolutely love cooking in! This dish is great, it has just enough kick in it for me! Add garlic, ginger, sugar, soy sauce, and red-pepper flakes. Toss to combine, and set aside. In a work or large skillet, over medium heat, heat oils to almost smoking. Meanwhile, season chicken pieces well with salt and pepper. Stir pan to coat bottom with oil and add seasoned chicken pieces. Once bottom side cooks through, about 3 minutes, flip chicken pieces to cook other side. 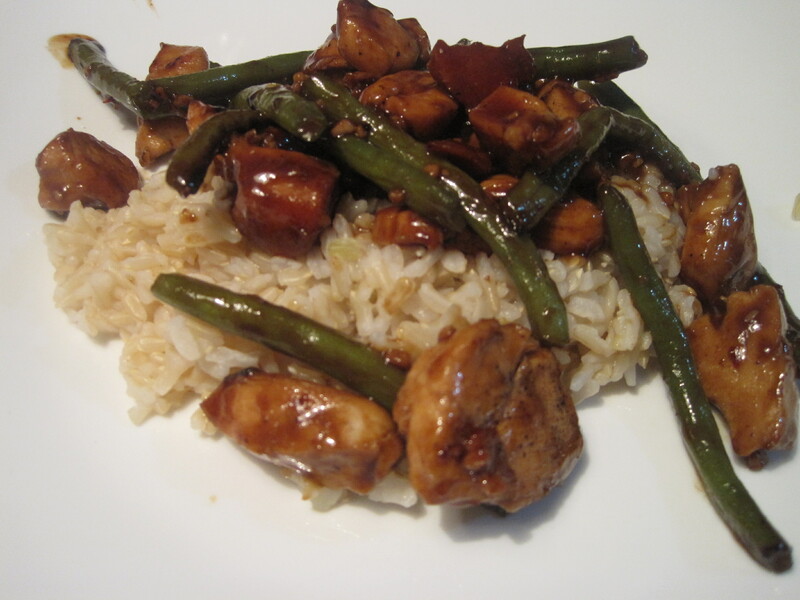 Cook chicken until almost done, then toss in green beans. Cook for about 3 minutes until chicken is done and green beans are crisp-tender. Turn to almost high heat, add cornstarch mixture and stir to combine well. Finish cooking, stirring constantly, until chicken is cooked through and sauce has thickened. Remove from heat and serve on fresh steamed rice. I’m always looking for new ways to cook chicken thighs, since we have them often in our house hold. I found this recipe in my Cooking Club’s April 2009 Edition. This recipe is so simple to throw together after a full day at work! I served mine with some white rice, because it is very saucy and you have extra sauce left over! This makes 2 servings, with about 435 calories per serving. Heat oven to 375 degrees. Place chicken on a foil lined baking sheet. Combine hosin sauce, oil and garlic. Spoon over chicken. Bake 25 to 30 minutes or until chicken is no longer pink in the center. Sprinkle with sesame seeds. To toast the sesame seeds, put them in a dry skillet over medium heat for about 1 to 2 minutes, or until lightly browned. Stir frequently. I saw this recipe of The Novice Chef’s Food Blog and bookmarked it and knew I had to make it ASAP because it looked so good! On her original blog post, she posted that this was a favorite with her and her family and it definitely holds true for ours! This we will definitely make again. This a great meal to make when you are having a football party this fall or just want an easy meal. We actually ate half our serving just with the ingredients listed, but then halfway through eating my husband said, I bet this would go good on a tortilla. We happened to have some left so we quickly got them out and wrapped them up with the ingredients and it was just as delicious! I adapted this recipe to make two servings. Mix salsa, sour cream, and chicken soup in another bowl. Add to crock pot. Shred chicken with forks and serve! I like the original poster made a side of rice to lay the salsa chicken on. I’m really start to love my cooking club magazine. It has a lot of reader made and tested recipes in it and they all tend to be rather healthy and very simple to make. Panko crumbs are lighter then your typical bread crumbs. They leave your food with a crisp and light coating. Panko is typically used in Asian inspired meals, but are becoming more popular then regular breadcrumbs because of their texture. I adapted this recipe a bit as the original recipe had just called for the shrimp to lie on a bed of peppers and peas, I added rice and laid the shrimp on a bed of rice, peppers and peas. This makes 4 servings and has about 410 calories per serving. Boil a few quarts of water for rice and cook rice. Heat 1 tablespoon of oil in a large non stick skillet or medium high heat until hot. Saute peppers, peas, mushrooms and onions for about 2 to 3 minutes or until crisp and tender. Add basil and stir in for about 20 seconds. Place cornstarch in a shallow dish. Beat egg whites and 1/2 teaspoon of the salt in a medium bowl. Place panko in shallow dish. Toss shrimp in cornstarch, dig in egg white, letting excess drain off and then coat with panko. Add 1 tablespoon of the oil to skillet, add dipped shrimp, dropped 2 to 3 minutes on each side and is golden brown and shrimp turn pink. Add remaining tablespoon of oil if needed. Continue to do this with all the shrimp. Place rice on plate top with veggies, top the veggies with the shrimp. Risotto is food that when you cook it, it’s either a hit or a miss. Cooking risotto has everything to do with timing! With risotto you have to cook the hard rice before you actual cook it, some call this technique toasting. I never have had edamame but hear there are so many health benefits of it, so I decided to make a edamame and mushroom risotto. It was so creamy, the flavor that the edamame and mushrooms gave the dish were tremendous. I feel sort of silly posting this picture, because, well you can see, it’s missing a chunk of the risotto and it’s not on a pretty dish. I forgot to take the picture after it was plated because I had friends over and they were looking at me like I was nuts for taking pictures of my food, so I had to take the next day. When I went to take the picture I couldn’t resist not to take a spoonful out! This makes four servings. Heat 1 tablespoon of the olive oil in a large skillet over medium-high heat. Add mushrooms and cook for 5 minutes, stirring occasionally, set aside. Cook edamame about 5 minutes. I steam them in about two inches of water. Drain the beans and add with mushrooms back into the skillet. Place broth and water into a medium saucepan and bring to a simmer. In a large saucepan heat remaining oil over medium heat. Add onion and cook 5 minutes. Add rice and stir until rice is coated with oil. This is what some call toasting the rice. Cook for one minute, stirring it constantly. Add wine and cook until wine is absorbed, about one minute. Add 1/2 cup of the simmering broth mixture. Cook over medium low heat, stirring until broth is absorbed. Add remaining broth mixture, 1/2 cup at a time, cooking in the same manner. It takes about 30 minutes. Gently heat mushrooms and edamame, stir in rice and remove from heat. Stir in the pepper and 1/4 cup of the cheese. Divide the risotto among four bowls and sprinkle with the rest of the Parmesan cheese. This a super easy meal to make on a week night, prep time is almost slim to none and cooking time is also very short. It’s also a fairly cheap meal at about $1.93 per serving. I’m not a huge fan of curry, but the curry is so slight that you do not really notice it. Either that, or again as I get older I like things I previously haven’t liked! This meal is also pretty low in calories as it has 395 calories per serving. This makes two servings. 1) Prepare rice according to package directions. 2) Cook broccoli in saucepan with boiling water for four minutes. Drain and set aside. I originally was going to make this with chicken, but decided against it because we had chicken already this week. We had some leftover shrimp in the freezer, so I decided to use that instead. This came out great! It’s very low in calories, so I made a small side salad to go with it and we also split an artichoke. The veggies really bring out the flavor in the shrimp, so much so that you don’t need to add seasoning, besides a bit of pepper to it. This makes two servings(although we got 3 meals out of it) and has 315 calories per serving. Another great thing about this dish is that is very easy to make on a week night. 1) Cook risotto as package directs. 2) Heat skillet, add oil and let it heat up for a minute. 3) Toss zucchinni, asparagus and mushrooms in skillet and cook for about 10 minutes or until veggies are tender. 4) Toss in peas and tomato and saute for about 4 minutes. Add shrimp and toss till pink. 5) Lay a bed of risotto and top with shrimp/veggie mixture.